MANY WERE ABSENT AT ROLL CALLThe next morning, out of range of enemy shell fire, Major C. T. Holcomb, commanding 2nd Battalion, 6th Marines, 2nd Division, called a halt for a moment's rest. 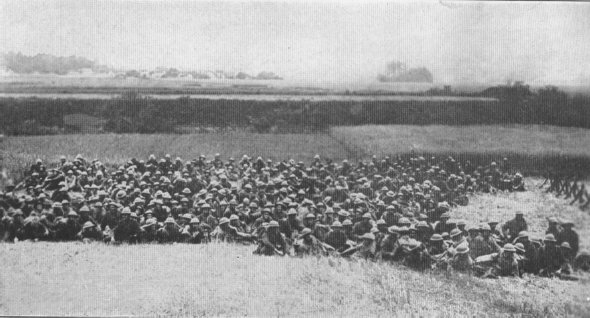 This photograph shows all that remained of the battalion. 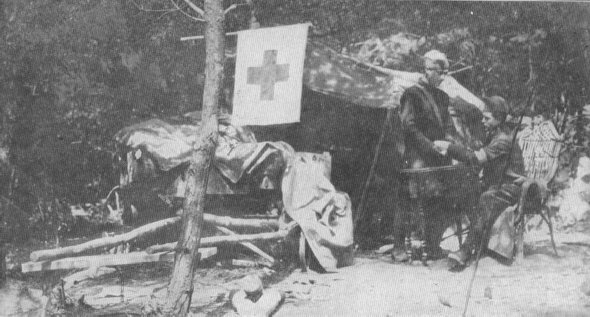 "FIRST AID, FOR THE LOVE OF GOD"First-aid station, Battery A, 6th F. A., Bonvillers, June 10, concealed from enemy observation by trees and camouflage, receiving wounded who were able to get back. After first aid was given, they were sent to field hospitals.